Summary: Each member of the TMNT has some sort of weakness and some sort of secret. What are they and what happens when the guys get part of what they want? Summary: Ninth grader Kalina Porter always hung around with the older kids. She frequently felt that the kids in her own class were not the type of people she wanted to be associated with. So she turned to her sisters friends. They accepted her the way she was, sometimes thinking more mature and clearer then themselves. It wasn�t until the one boy in the group she felt she really connected with gets with Rachel, her sister, that she realizes how much she liked him. He�s the Perfect One. Summary: It had been nearly four years since AJ and Lauren had taken different roads amidst a bitter goodbye. Stubborn as they both were, they refused to look past the emotional pain and heartache each unknowingly caused the other, drowning in the past and unable to see the future. But they weren't the only ones hurting. Someone else was being torn apart within the equation of their broken relationship. As a small child grows up incomplete and confused without his father, it becomes apparent that somethings are worth a second chance. Summary: Tina McLean is A.J. 's baby sister. Her world is turned upside down as her big brother leaves to become a world famous pop star. Now she is faced with life challenges without the constant care of her brother. As A.J. 's career begins to develop, he continues to show her that no one can replace his baby sister. 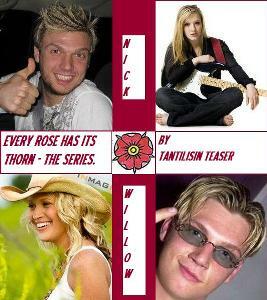 Follow the adventures of the Backstreet Boys as they find out what it's like to be a girl. A group a short stories that follow the boys through their humorous journey of womanhood. These are the stories of the APO agents that chronicles their individual missions. Each of the agents will be featured in their own story and will be written in first person POV). *Also included in this series are the stories: "Authorized Personnel Only: Truth, Justice, Honor (still in developement), Safest Place to Hide," (which features the Backstreet Boys), and a possible third story (still in development).